The Colorado Springs superintendent used AP classes to narrow achievement gaps, but Seattle teachers and parents raise questions about the district’s charter schools and performance pay. 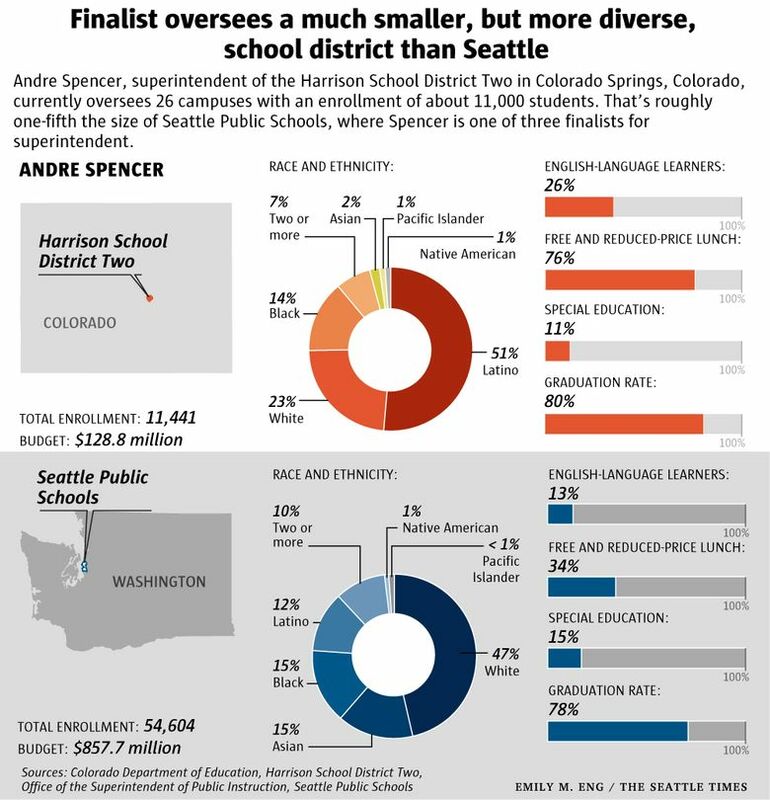 Andre Spencer, a finalist to become the next Seattle Public Schools superintendent, noticed a troubling trend five years ago when he took the helm of Harrison School District Two in Colorado Springs, Colorado. The district offered just seven advanced courses for its more than 2,000 high-school students. And, more concerning to Spencer, virtually all of the students in those classes were white. So the newly installed superintendent first eliminated a rigid set of criteria that prevented many students of color from having the chance to try the advanced courses. The district also expanded its offering of advanced classes, nearly tripling the number to 19 as of last year. And now, close to two-thirds — 64 percent — of Harrison High School students who took exams for college credit in an advanced course identify as black or Latino, compared to 26 percent who identify as white, according to a report by A-Plus Colorado. Academic-achievement gaps: Seattle’s student population has one of the worst racial disparities in achievement in the nation. Outgoing Superintendent Larry Nyland calls eliminating opportunity gaps between groups of students “the issue of our time,” but the gaps continue to grow. A 2016 study from Stanford found that black students in Seattle tested 3 ½ grade levels behind their white peers, and the researchers’ 2017 update found the gap had widened to 3.7 grade levels. Last year, 39 percent of Native American/Alaska Native eighth-graders were proficient in English-language arts, compared with 83 percent of white eighth-graders. Contract negotiations: The Seattle teachers union and school district will be negotiating the union’s contract, which goes into effect later this year. In 2015, union members went on strike after those negotiations stalled, delaying the start of school for a week. Budget shortfall and upcoming levies: The district projects a budget shortfall in the coming years and plans to submit two school-funding levies in February 2019. The 2019 operations levy would renew an expiring operations levy, which provides about 20 percent of the district’s general fund. A capital levy would fund construction projects to modernize or replace aging buildings. The Denver-based research and education advocacy group also has credited Harrison schools, where a stunning 76 percent of students live in poverty, for significantly raising the performance of historically underserved children. “If you just look at the last three years of data, we’ve seen improvement for every group of students in Harrison,” said Lisa Berdie, policy director with A-Plus Colorado. That track record could play well with the Seattle School Board, which in 2013 pledged to close its long-standing — and widening — gaps in academic achievement between students of color and their white peers. 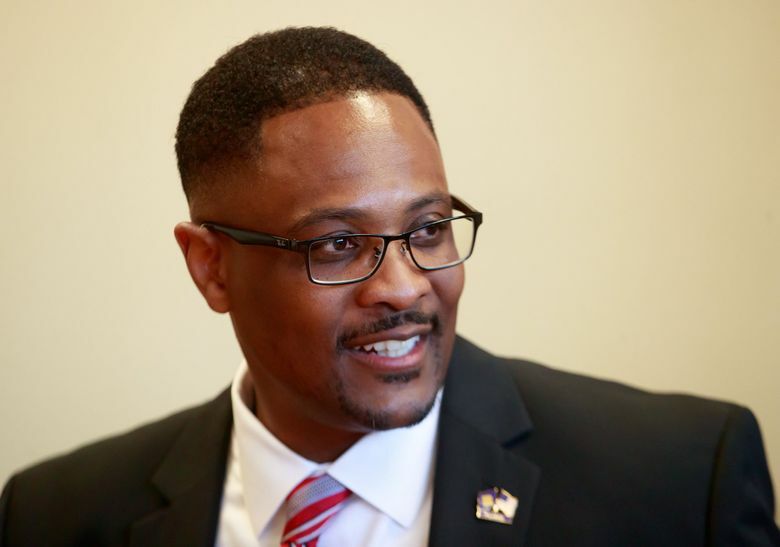 But public reaction to Spencer’s long résumé has focused less on his success with supporting all students in Harrison schools and more on what some consider red flags. That includes the four charter schools operating in his current district and a pay-for-performance plan that ties teacher salaries to student test scores. “Funny, our School Board did set a resolution against charter schools, and he’s very much in favor,” said Phyllis Campano, president of the Seattle Education Association. Spencer, however, stressed that he inherited the charters and merit-pay system from his predecessor — and that what may work in Harrison schools may not in Seattle. He has also drawn criticism for his graduation last year from The Broad Academy, a training program for current and aspiring superintendents. Longtime education watchers in Seattle quickly noted former Superintendent Maria Goodloe-Johnson also graduated from that program. The School Board fired Goodloe-Johnson in 2011 after a financial scandal. She also faced scrutiny for a controversial plan to close schools and for a contract that included student performance as one element in teacher evaluations. After serving as a data specialist for the U.S. Army, Spencer got his start in education as a science teacher in Baltimore City Public Schools. He eventually became an assistant principal and principal before working as an area superintendent. Spencer credits his love of science, however, for his obsession with poring over data to study the root causes of problems in schools. It’s an obsession that convinced Samuel Sarabia, deputy superintendent of the Houston Independent School District, to recruit Spencer in 2010 to work with him as a regional superintendent. In Houston, Spencer oversaw between 12 and 15 schools each year, but he now leads 26 schools in Colorado Springs. That’s still a fraction of the 103 campuses he would oversee in Seattle, and Washington state’s largest school district operates with an $857.7 million annual budget — more than six times what Spencer handles currently. Still, Sarabia didn’t doubt his former employee could successfully steer a much larger, urban district. “Baltimore and Houston are not small. We’re 333,000 square miles, and although (Spencer) served a subset of it, he was running across the community, working with very, very different constituencies,” Sarabia said. But in Seattle, Spencer already appears to have lost key constituencies, including the teachers union. Parents also questioned his frequent mention of private industry’s role in public education during a forum the School Board hosted with all three finalists last week. Spencer, for example, didn’t directly answer a question about how to address wide disparities in parent fundraising for schools. Instead, he brought up the importance of business leaders stepping up to donate more to their neighborhood campuses. 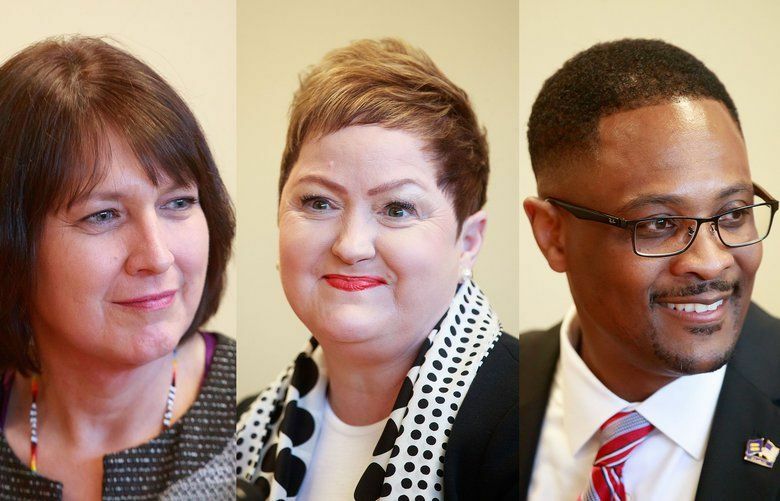 “Wow, is he a finalist for (Seattle Public Schools) superintendent or for the executive director of the Chamber of Commerce?” Summer Stinson, a Seattle mother and attorney, asked rhetorically on social media during the forum. In Colorado Springs, Spencer said, businesses — rather than a mandatory redistribution of the money parents raise — have helped fill in the gap for his less-affluent students. Local law firms, he said, have donated coats to every single student in particular schools. “We just have to let business know where the need is, and they will want to get involved,” Spencer said. His approach earned the praise of Jeannie Orozco, a new member of the Harrison Board of Education and longtime community organizer in Colorado Springs. She recommended Spencer for the Seattle job and highlighted his deep engagement with businesses and nonprofits to connect students from poor and homeless families with services they need. “He’s done an amazing job for us,” she said. “We’ve been happy with him, and he’s outstanding, so definitely not anyone we want to lose.